As England becomes enmeshed in the early days of World War II and the men are away fighting, the women of Chilbury village forge an uncommon bond. They defy the Vicar’s stuffy edict to close the choir and instead “carry on singing,” resurrecting themselves as the Chilbury Ladies’ Choir. We come to know the home-front struggles of five unforgettable choir members: a timid widow devastated when her only son goes to fight; the older daughter of a local scion drawn to a mysterious artist; her younger sister pining over an impossible crush; a Jewish refugee from Czechoslovakia hiding a family secret; and a conniving midwife plotting to outrun her seedy past. An enchanting ensemble story that shuttles from village intrigue to romance to the heartbreaking matters of life and death, Jennifer Ryan’s debut novel thrillingly illuminates the true strength of the women on the home front in a village of indomitable spirit. Lately, I have been on a kick with reading books set during WWII. It began with The Nightengale by Kristin Hannah and I am definitely not slowing down. I am not typically a fan of war books and that is why I have really shied away from reading books set during a war but what I love about the books I have been reading is that they're telling the story from the aspect of those lives who are left behind during the war- the women, the elderly, the children, and the men who can't serve. Every single person is left to worry about air strikes, Nazi invasions, will their loved ones be safe, rations and so on. Chilbury Ladies' Choir is absolutely beautiful for more than one reason. The story is told in journal format from more than one viewpoint and each viewpoint brings an important bit of what life is like while telling the story of the war. The reader gets to experience the flippant and narcissist games of Venetia while also getting to experience her personal growth and experiencing her tragedy, her love, and her maturity. Venetia's young sister, Kitty, shares her views through the eyes of the arrogance of being a teenager- the selfishness, the gloating and most importantly- the changes and the harsh reality of life. Silvie shares a little but not a lot as the viewpoint of a Jewish smuggled out of Czechoslovakia. Instead, we get to experience Silvie's through the eyes of the family giving her a safe home. Mrs. Tilling is a midwife whose son has gone to war while billeting an officer of the war. Mrs. Tillings growth is amazing and frankly, she became my favorite character through the book. Miss Prim brings life to Chilbury. She encourages every woman in the village that they're important and that they can carry on their choir without men. She gives each and every one of the villagers a purpose, strength, and life. I absolutely adored her. 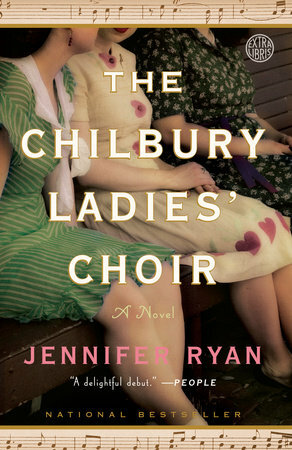 The story of Chilbury Ladies' Choir is beautiful and the reader gets to experience class struggles, love, fear, loss, heroism, and strength. The entire book is absolutely endearing and charming. Every character was engaging and unique. I really, REALLY hope for a sequel. I want to know about their lives after the war. Come on Jennifer Ryan- PLEASE LET THERE BE A SEQUEL! I highly recommend Childbury Ladies' Choir.